On September 15, 2015, Superintendent of Public Instruction Tom Torlakson released the much anticipated A Blueprint for Environmental Literacy: Educating Every California Student In, About and For the Environment at a press conference at Abraham Lincoln High School in San Francisco. The Blueprint was created over the course of a year by a 47-member Environmental Literacy Task Force (ELTF) appointed by Superintendent Torlakson. I co-chaired the Task Force along with Elizabeth Babcock of the California Academy of Sciences. The press conference at Lincoln High was followed by an inspiring and super-energized reception hosted by Ten Stands in the Presidio of San Francisco. The reception was attended by about half the Task Force members, Tom Torlakson, California Secretary of Natural Resources John Laird, several funders who supported the Task Force, and various friends and VIPs. The following is a slightly edited version of some of the thoughts I shared at the reception. We environmental educators, especially those of us on the Environmental Literacy Task Force, are like family now. We have been through this incredible journey together, with plenty of ups and downs, resulting in the completion of A Blueprint for Environmental Literacy. During the press conference at Lincoln High, Superintendent Torlakson, Elizabeth and I all made outward facing comments directed at the larger education community and the public. I want to use this opportunity to have a family chat. When I accepted the role to co-chair the Task Force, I thought I knew the field of environmental education in California. I’ve worked in the field for a long time and thought I understood the landscape pretty well. Soon after starting to work with you all, however, I was surprised—even taken aback—by how many facets there are to environmental education and how many factions there are in our field in California alone. We all came to the Task Force representing our faction: there are the in-school people and the out-of-school people; there are the classroom people and the outdoor people; there are the school garden people and the green schoolyard people (who are different from the school garden people); there are the nature and wilderness people and the urban environment people; there are the EEI people and Project WILD people, and on and on. When we first met as a Task Force it was a little rough, a little competitive, and we were all positioning ourselves. Many of us felt like we needed to protect and defend our corner of environmental education and make sure that it got the appropriate attention and opportunity for future resources. We have been in such a resource-starved environment for so long we have grown accustomed to fighting over scraps. Over the course of the year that we worked together, the Environmental Literacy Task Force had many outward facing accomplishments, including the publication of the Blueprint. But within our community, between us, I think that our most important achievement is that we re-discovered the things that we share in common. We found again the things that we could all agree upon and come to consensus about—the things that we all believe deeply. Those are the things that brought us all into the field to begin with when we were young. This Blueprint is not a blueprint of lowest common denominators and it is not a kitchen sink either. This Blueprint represents only the ideas and recommendations that we all agree are the most important to carry forward. As we move forward, this is what we all need to remember. It is the ideas in the Blueprint that we need to rally around, not our respective corners of environmental education. We are no longer fighting over scraps. Environmental literacy is no longer on the margins, no longer on the periphery trying to be seen and waiting for leftovers. There is now broad acknowledgment that the environment is important, that climate change is serious, that the ocean needs to be protected, and that it is the right of every student to experience, enjoy, and learn to protect the natural world. 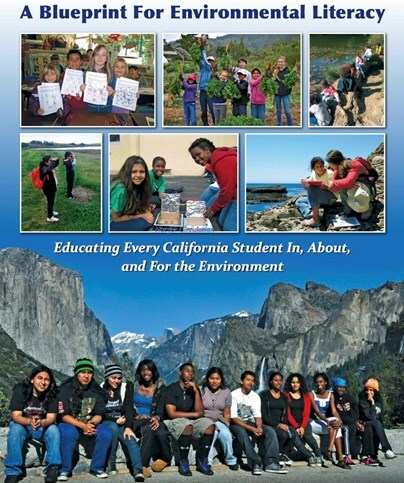 Environmental literacy is now central to the education of every child in California and essential to achieving the ambitious vision of the Next Generation Science Standards and the Common Core State Standards. Imagining ourselves at the center, within the core of the mainstream education system, requires that we change our behavior. We cannot accomplish our enlarged goals from our respective corners. We cannot do what needs to be done any longer by vying for a share of the few resources that have been available in the past. We need to work together to create more resources, make a much bigger pie, and realize a whole that is greater than the sum of its current parts.